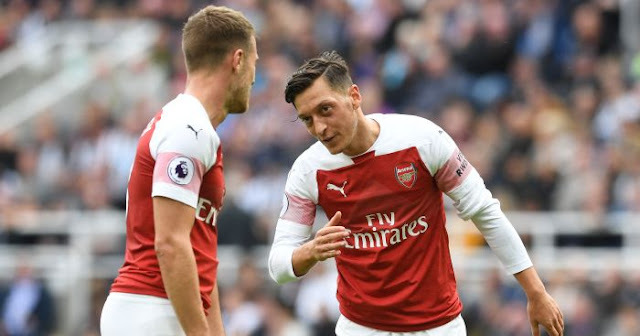 Ray Parlour has said that he believes that Arsenal should have opted to sell Mesut Ozil and rather renewed the contract of Aaron Ramsey. The Welsh international Ramsey looks to be headed out of the club at the end of the season after signing for the Gunners In 2008 from boyhood club Cardiff City. The 27-year-old has yet to sign a new contract at the Emirates with his current deal set to expire at the end of the season. Rumours have suggested that Unai Emery’s side are not prepared to give into his wage demands. Ramsey is now at the peak of his career and is one of the best midfielders in the Premier League so he is sure to not be short of offers from top-dogs within the Premier League and throughout Europe once he is a free-agent or is the Gunners decide to sell him at a cut-price deal in January. Parlour does have a valid point. Ozil has been inconsistent this season and was not involved during the Gunners 4-2 weekend Premier League win against Tottenham in the North London derby. The former Germany international has endured a difficult year personally after being heavily criticized for his countries disastrous 2018 World Cup campaign and does not appear to be the player that he once was. Parlour said to talkSport: “My personal decision would be that I’d rather keep Ramsey than Ozil. “I think Aaron brings a little bit to the team. “Mesut Ozil is a great player, I’m not doubting that, but you can leave him out. We didn’t miss him [against Tottenham], whereas I thought Ramsey made an impact in the second half. “Aaron has been there a long time, he’s been there for 10 years, so you’ve got to look that as well. “Some players would sulk and say, ‘I’m leaving at the end of the season, so it doesn’t really matter’, but his attitude has been spot on. “He knows he’s leaving at the end of the season, but he was brilliant in midweek in the Europa League.